I work from photos of your pet or favorite animal to create a unique oil painting just for you! I like to have several photos to use as a reference, even though I will use one for the main composition of your painting. 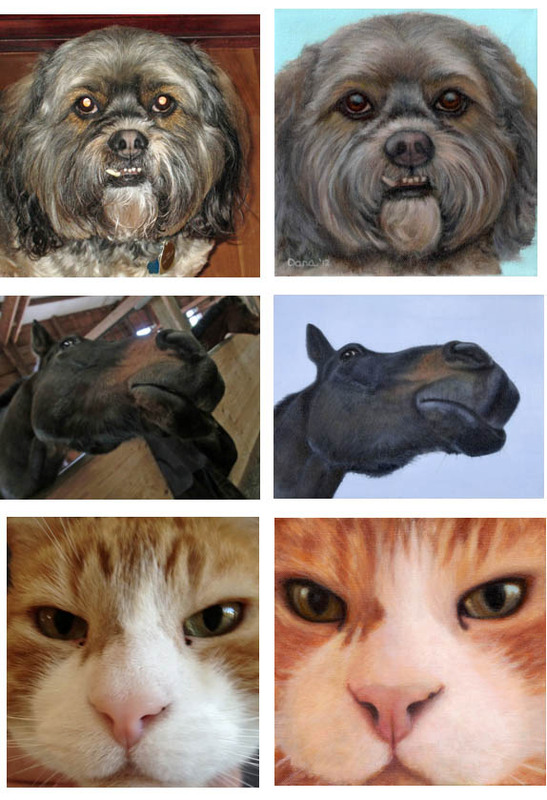 Clear photos of the animal’s face and eyes are critical. Outdoor photos are best as there is no flash to hide the detail and flatten their features. Once you share your photos with me electronically (this is ideal) or by mail, I can crop them up in Photoshop to give you an idea of what your painting would look like on the canvas size you have chosen. Once you approve the cropped photo, a 50% deposit is due, and I will begin your painting. All portraits are hand-drawn and painted by me, using artist quality oils on stretched canvas. Typically, it takes 4-6 weeks to complete the painting, but depending on the number of pieces I am working on, it may be longer. I can tell you what to expect at the time you express interest in a custom painting. Once your painting is completed, I will email you a photo of the finished piece for your approval. If any tweaks are requested, I will make them. I guarantee my work, so if you are not pleased with the finished result, even after modifications, I will refund your initial deposit. However, I do reserve the right to sell your painting to someone else. Final payment for the painting and associated shipping costs is due prior to shipment. If you have specific questions about the process, please don’t hesitate to contact me at danfeaginart@gmail.com. I donate proceeds from my commission sales to these animal charities: SanctuaryOne.org, FOTAS.org, and Equamore.org. Repeat customers receive a 10% discount on custom paintings and completed paintings listed on my website. Prices for one pet, head or head and shoulders only on a one-color background begin at $600 for a 10 x 10 inch painting. More popular sizes and prices are noted below. Additional canvas sizes & depths, different backgrounds, and partial/ full body portraits are also available; pricing adjustments for these vary based on portrait size and complexity of the request. Custom portraits are delivered without a frame, as most clients prefer to select a frame that suits their taste. If shipping is required, the cost of shipping will be added to the price of your painting once the painting is completed and packaged for shipment. I ship via Federal Express Home Delivery and USPS; all paintings are insured for the full purchase price.